1990 - Mary received Blackhawk College Quad-cities Higher Education Award. 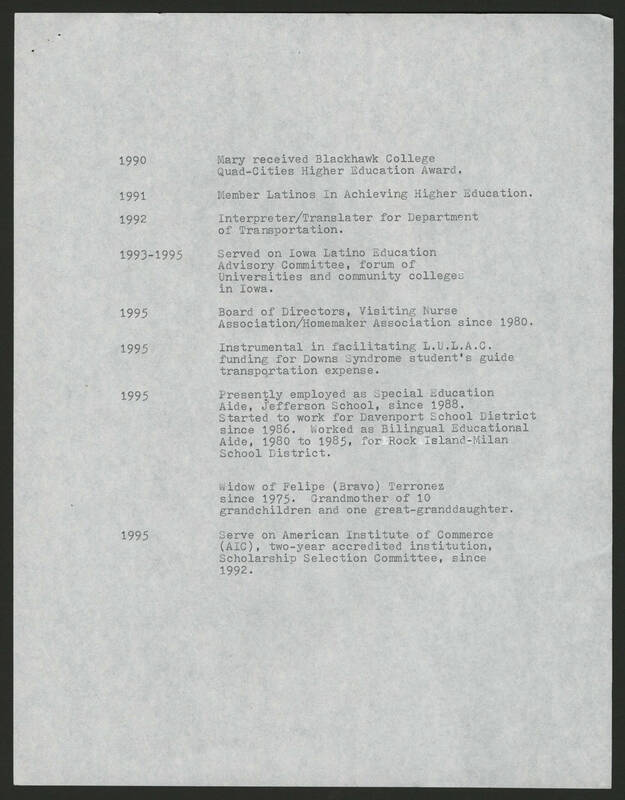 1991- Member Latinos in Achieving Higher Education. 1992- Interpreter/Translater for Department of Transportation. 1993-1995 Served on Iowa Latino Education Advisory Committee, forum of Universities and community colleges in Iowa. 1995- Board of Directors, Visiting Nurse Association/Homemaker Association since 1980. 1995- Presently employed as Special Education Aide, Jefferson School, since 1988. Started to work for Davenport School District since 1986. Worked as Bilingual Educational Aide, 1980 to 1985, for Rock Island Milan School District,. Widow of Felipe ( Bravo) Terronez since 1975. Grandmother of 10 grandchildren and one great-granddaughter. 1995- Serve on American Institute of Commerce (AIC), two-year accredited institution, Scholarship Selection Committee, since 1992.